It's impossible to produce a design with accurate colours, unless you know what it's going to look like. At the very least, you need to produce a proof, and assess it in good lighting conditions. Often, you will need to match some previous artwork, printed materials, or photographs and transparencies. The range of White Screen Viewers described below will meet all of these needs. The White Screen range is now distributed in the UK exclusively by Cherlyn. Because of variations in lighting, the appearance of colours can change, so you need consistent and good lighting conditions to make accurate judgments. The generally accepted standard for the graphic arts and photographic industries is ISO 3664:2000. This specifies minimum light intensity, illumination equivalent to a colour temperature of 5000K, and a visual environment that doesn't interfere with the viewing judgment, i.e. a neutral grey background. All White Screen products conform to ISO 3664. Copy Holders - These White Screen Copy Holders provide excellent viewing conditions, with top illumination for reflection viewing of photographic prints, artwork, or original print samples so you can see what you are aiming for. Then view your printed proofs for comparison. Also, models are available with both top illumination and back illumination for viewing transparencies. Illustrated is the popular Model 10.501, which has a 20 x 34 cm transparency viewing area. Also available is a larger size, with 30 x 47 cm viewing area. Both these units have a small footprint and are ideal for placing alongside a design workstation. Options for dimmable lights allows the illumination intensity to be matched to your LCD or CRT displays, for more accurate colour comparison with the on-screen image. DTP Viewers - White Screen have designed these viewers specifically for placing alongside DTP workstations. 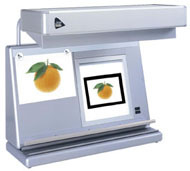 They allow simultaneous viewing of printed copy or proofs in reflection, and photographic transparencies in transmission, in one economical unit. Once again, a small footprint is an important feature. Viewing area for reflection is A3, and the transparency viewer is 24 x 24 cm, adequate for most DTP requirements. These viewers are available with either fixed illumination, or with illumination separately dimmable on both the copy viewer and transparency viewer to improve colour accuracy when compared with the LCD or CRT display. The Model illustrated is 520.152, with dimmable illumination. Lighting conditions conform to ISO 3664 in all respects, with 5000K illumination best suited to general graphic arts applications. Transparency Viewers - For purely transparency viewing, we offer the full White Screen range, from small slimline portable units that will fit into a briefcase, to larger conventional Flat Viewers, and inclined Light Desks with viewing areas up to 112 x 37 cm. Smaller units can be mounted upright, so have a smaller footprint, or can be supplied with a swivel arm for fixing at the side of a bench or workstation. Larger Flat Viewers or inclined Light desks rest on the surface of a workbench. Illustrated is Model 20.013, a popular conventional flat viewer, with a viewing area of 33 x 31 cm. All Transparency Viewers, Flat Viewers and Light Tables are produced in silver anodized satin aluminum. Light intensity is approx. 5000 Lux, with a colour temperature of 5000K, conforming to ISO 3664.